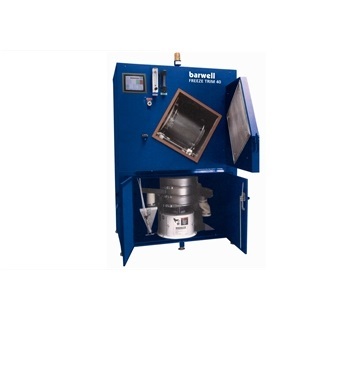 Moulded parts are placed into a perforated stainless steel parts basket and then inserted into the blast chamber of the Freeze Trim and the basket is mechanically rotated to expose all parts to the blast media. Liquid nitrogen lowers the temperature while freezing the rubber to make it brittle. The physical properties of the parts are not affected during the deflashing process. A unique high speed impeller directs and throws the polycarbonate media into the rotating basket and by travelling at high speed, the small pellets cleanly trim off the brittle flash leaving a high quality, flash less moulding.